And in a bold surprise. Surprisingly, a lot of glittering military and municipal leaders of the Russian Federation has presented a difficult period XVIII-XIX centuries. And Peter Konovnitsyn occupies a prominent place among the galaxy of talent. According to his contemporaries, he was one of the best Russian generals of the war in 1812. 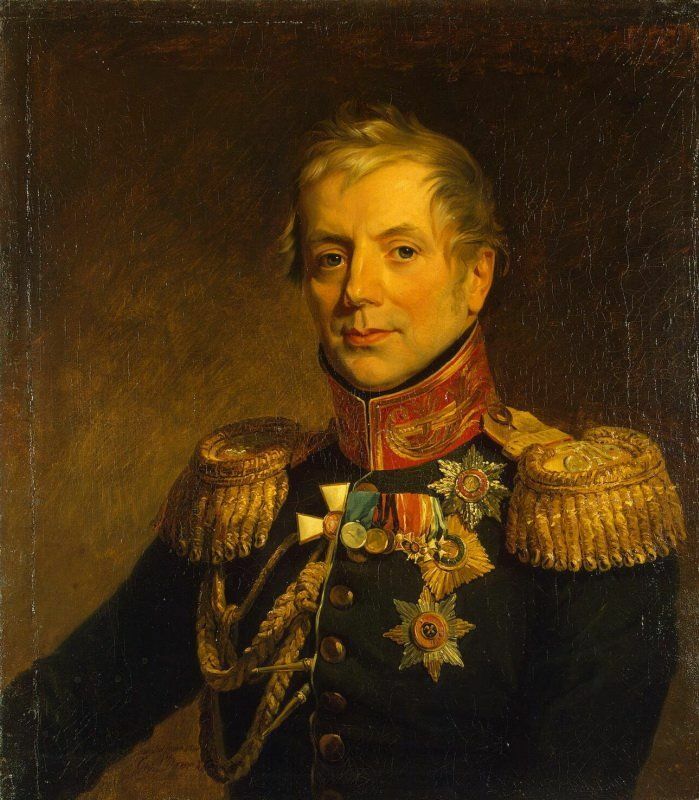 But after the Decembrist uprising, in which involved his two sons, the king, and later the Russian historical science is silent about the name of a brilliant general and minister of war (1815-1819). Fortunately, the situation began to change. Petr comes from an old noble family, which has a common ancestor with the genus of the Romanovs. Konovnitsyn Peter was born in 1764 in Pskov, graduated from home, although youth was assigned to the artillery and engineering Cadet Corps .. Yet, due to the natural mind, Peter P. graduates of these institutions did not concede that justified the brilliant successes of the service and its not only on the military, and in administrative positions. In September 1774 recorded fulerom Semenov regiment. The true Konovnitsyn military service began in January 1785 with the rank of ensign. After 3 years, the young Konovnitsyn priniat role in the Russian-Swedish war, and in 1791 with the assistance of his father — the governor of St. Petersburg — is the purpose of the active army, adjutant of Prince Potemkin. In combat, however, did not have time to participate. In Iasi, Peter is the first time he met with Kutuzov. After the victorious end of the war with the Turks Konovnitsyn received the rank of lieutenant colonel and command the mission Stary Oskol musketeer regiment. In this capacity, he participated in combat operations in Poland against the Bar Confederation. For the differences in the battles Konovnitsyn was awarded with Order of St.. ZHoru 4th degree and an increase to the colonel. By the time Peter Petrovich turned 30. Once on the throne by the governor Paul happened quite usual for the time of his reign situation: Konovnitsyn increased to major-general, appointed first chief of the Kiev Grenadier later Uglich musketeer regiment, and then, in 1798, sent in his resignation. The next 8 years, Peter spends his estate Kiyarovo Petersburg province, where there is no wasting time in vain, doing a lot of reading and science. By the beginning of the wars of the Fourth Coalition (1806), Peter Konovnitsyn vorachivaetsya to St. Petersburg, and soon, with the approval of Alexander I, was elected to the position of chief of national militia. As such, takes an active role in the formation and sending troops to Europe. Under the direction of Peter Petrovich was prepared 4-battalion. Less than a year later, in 1807, the governor Konovnitsyn translates into his entourage. Later year, In 1808, he was reappointed to the army general duty under the command of General Buxhowden. Despite the fact that the post was of a more administrative nature — the duty Gen. was in charge of procurement and maintenance Army — Konovnitsyn not miss the ability to take part in the fighting. So, he distinguished himself in the assault Sveaborg — principled basis rowing fleet Swedes. For this, as well as for several other battles, including taking Svartgolma in 1808 received an increase to lieutenant general. He became famous in the war Konovnitsyn and as commander of the fleet. Also in 1808 under his command was repulsed an attack on Cape Runsalo. In 1809, the actions of Peter Petrovich, who commanded the 3rd Infantry Division, which suffered Swedish troops in the village of Abu. This operation was marked by the Order of St.. ZHoru third degree. After the conclusion of peace treaty of Tilsit, and Russia's accession to the continental blockade, the division Konovnitsyn involved in the protection of the Baltic Sea. During this period, the division comes to the number of the best combat training. The outbreak of war with Napoleon the 3rd Infantry Division met in the 1st Army Barclay de Tolly. On the unit Konovnitsyn lies languid task to cover the retreat of the 1st Army. First battle with the French held on July 14 under the island. Freshest Division Konovnitsyn replace battered body of Count Ostermann-Tolstoy. Near the village, with heavy pronounceable title Kakuyavchino, 3rd Infantry Division, which is holding back the troops of Murat and Eugene Beauharnais, allowing relaxed retreat 1st Western Army. In totality, the acts Konovnitsyn at the beginning of the war on the day of the coming of the mighty are detained by the army Vitebsk. In stubborn battle of Smolensk Peter Petrovich was entrusted to one of the most difficult and insecure areas — Malakhovskoye gate. Konovnitsyn was wounded, but did not leave the battlefield. A little later with General Ermolov defended Valutina mountain, covering the retreat of the army. From August 29 Konovnitsyn appointed to command the combined armies of the rearguard. Daily battles with Murat's cavalry forced the French to fully appreciate the skill Konovnitsyn-general. General Segur, citing Marshal Davoust, read about the fact that the Russian retreat in an unusual manner, taking the best possible strategic position and protect them as much as you want, move them is not determined by the actions of Murat, but the terrain. 1 September a 13-hour battle of Gzhatsk against the vanguard of the French troops, the soldiers stood Konovnitsyn, gave the Russian army a sufficient amount of time in order to move to the very cooperated Borodino. In the bloody battle of the war Russian division Konovnitsyn held the position in an old Smolensk road, until it turned out the main direction of the impact of Napoleon. At 10 am, the 3rd Infantry Division went to the main positions of the 2nd Army and litsezrev that flushes at Semenovskoy occupied by the French, Konovnitsyn blow to the back of strengthening bayonets. After being wounded Petr Bagration temporarily takes over command of the 2nd Army, and takes her to the position of the ravine Semenovsky: about 300-400 meters from the flash chip. There Konovnitsyn, use the advantages of terrain, organize a strong defense. Arrived on orders Kutuzov Dokhturov takes over command of the 2nd Army, and appreciates the actions Konovnitsyn. When defending positions Peter was twice wounded, the uniform was torn apart by shrapnel shells, but the fields bout he left. After Borodino Konovnitsyn appointed commander of the 3rd Infantry Corps, commanded by Gen. Tuchkov — in the battle, he was mortally wounded. At the council at Fili Konovnitsyn spoke in favor of another general battle. But the council, headed by Kutuzov decided differently. officers and the army, in addition, the loss of Borodino, which is estimated at 40 thousand soldiers and officers, could not lead to a partial disruption of the army. The armed forces have been at the time, in practice, the main social elevator, and was a tangle of intrigue. In such a situation required a chief professional and conscientious administrator, alien intrigue and scheming. Given all of this — the best candidate than Konovnitsyn post the general of the whole army was not simple. Pyotr Petrovich would be a great experience in performing similar obligations. Suffice it to recall the position of the head of national militia, or its role in the Russian-Swedish war of 1808-1809. Staff work Konovnitsyn exhibits phenomenal energy, all his strength, applying to strengthen the army. During this period he sleeps three to four hours. In Tarutinskoye Konovnitsyn camp run by the completion of training and army supplies, replenishing supplies, and many others. With all this Peter Petrovic not for one moment do not forgets about the affairs of the front, often referring to Kutuzov to prevent its active operations. Despite the discomfort due to fever and requests commander not to risk Konovnitsyn participates in the fight against Murat's body under Tarutine where nearly dies. Later, Peter is involved in a battle near the village of reddish and Maloyaroslavets already Kutuzov himself obliged to turn to a professional for a return of the general town under the control of the Russian army. This coming from Maloiaroslavets to the Niemen, Konovnitsyn resides on the same staff positions, de facto, serving as chief of staff. All correspondence military generals in chief passed through it. Foreign march of the Russian army brought Peter Petrovich exemption hateful cardboard work. He was appointed commander of the Grenadier Corps, which is in the military hierarchy was listed second after Gvardeyskogo.Konovnitsyn uchuvstvovat in battle at Lutzen, where he received a severe wound in the leg and was sent to the healing mineral waters. In 1815, another very lame accept a role in the Battle of Leipzig. With the end of the Napoleonic Wars to Alexander I need a reliable and efficient manager of the military. Straseni increased military spending could not affect the state treasury. The governor made no mistake in choosing the already first year Control Department, bore fruit, for which Peter was presented the Order of Alexander Nevsky with diamond signs .. In 1819 Konovnitsyn because of the sharply deteriorating health asks for the resignation. Alexander petition meets and sends money to healing mineral waters. Returning to healing, personal decree of the governor, appointed to manage Konovnitsyn cadet corps. But his health continued to deteriorate. August 22, 1822 Peter Konovnitsyn died. At the funeral service attended the first face of the country in which the variety was the future Emperor Nicholas I.